BIOS-SCOPE scientists and Atlantic Explorer crew deploy specialized zooplankton nets, to study how small swimming animals produce dissolved organic matter and influence microbial communities. Photo by Nick Mathews. Sampling offshore Bermuda this July, the BIOS-SCOPE (Bermuda Institute of Ocean Sciences – Simons Collaboration on Ocean Processes and Ecology) program completed its first full year of study to learn how marine microbes produce, transform, and leave behind dissolved organic matter as the seasons progress, and microbial communities wax and wane. Dissolved organic matter is produced from the waste and decomposition of the ocean’s plants and animals, and is so small (a fraction of the size of even the smallest bacteria) that it passes through an oceanographer’s finest filters. While dissolved organic matter is the primary source of energy for the roughly five million bacteria in every teaspoon of seawater, compounds that are indigestible to marine microbes can remain in the deep sea for thousands of years. 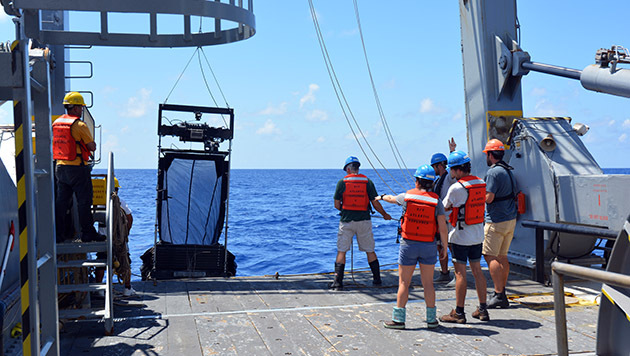 This was the second annual BIOS-SCOPE research cruise to capture the unique microbial communities and water chemistry that develop in the Sargasso Sea each summer. The team also sailed in September and in March, when colder temperatures and winter mixing can disrupt microbial communities that prospered in the summer, and redistribute dissolved organic matter to deeper waters where it may fuel the development of new microbial communities. Nicholas Huynh (left) and BIOS-SCOPE program director Craig Carlson, both from the University of California-Santa Barbara, working together on microbial experiments during the 2017 cruise. Photo by Nick Mathews. “Every time we go out, there is a great collaborative effort to describe our field conditions, and to set up experiments to fully characterize the organic matter and chase down the microbes that respond to it,” said the program director Craig Carlson, an adjunct scientist at BIOS and professor at the University of California-Santa Barbara. Carlson’s pioneering work at BIOS in the 1990s first established that microbial communities interact with dissolved organic matter in ways that are globally significant. Because the deep ocean can store massive amounts of carbon in the form of dissolved organic matter, the microbes that impact this reservoir also influence Earth’s carbon cycle. In experiments coordinated with the BIOS-SCOPE team, Carlson’s lab is using chemical and genetic analyses to sleuth out the species of bacteria that thrive on particular kinds of dissolved organic matter, including organic compounds produced by zooplankton as they swim throughout the water. The BIOS-SCOPE team includes physical oceanographers, marine chemists, microbiologists, and zooplankton ecologists from BIOS and five other research institutions in the United States and United Kingdom. Each member brings unique expertise and novel technologies to study the problem at hand. At BIOS, Ruth Curry’s MAGIC lab gliders constantly map evolving environmental conditions in the water. Scientists Amy Maas and Leocadio Blanco-Bercial are combining a new machine-learning imaging system with DNA sequencing to measure the diversity and ecological impact of the zooplankton in their samples. In the Microbial Ecology Laboratory, microbiologist Rachel Parsons uses specialized fluorescent probes to survey microbes under the microscope. From Woods Hole Oceanographic Institution in Massachusetts, marine chemist Liz Kujawinski’s lab is developing new high-resolution mass spectrometry methods to identify the chemical signatures of hundreds of unique molecules that make up dissolved organic matter. And at Oregon State University, professor and BIOS adjunct scientist Steve Giovannoni sequences microbial DNA to determine which species are present in the environment, and to garner clues about their metabolic capabilities. Microbial ecologist Ben Temperton, a BIOS-SCOPE member from the University of Exeter in the U.K., is also analyzing the massive amounts of DNA sequences generated by the project for signatures of marine viruses that impact bacterial communities. “I find our skills as microbiologists integrate very nicely with the dissolved organic matter chemistry and the oceanography that others are so expert at,” Giovannoni said. 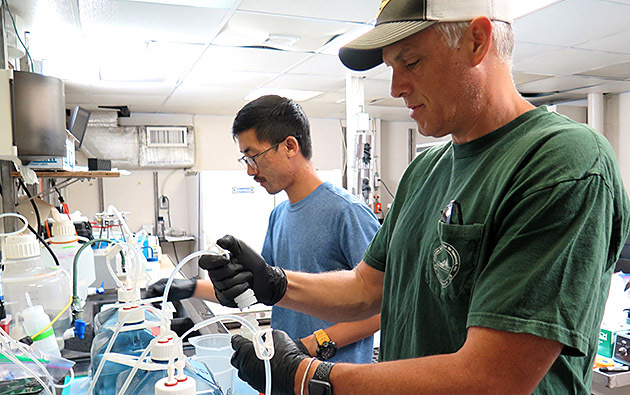 In one exciting avenue of BIOS-SCOPE research this year, the team has been investigating a particular “bug” that may be responsible for the final steps of dissolved organic matter degradation in the deep ocean. In April, the Giovannoni lab published an analysis of genomes from an abundant but mysterious bacterial species known as SAR202. Their study revealed that SAR202 (the name reflects that it was the 202nd sequence isolated from Sargasso Sea bacteria) is packed with genes encoding powerful oxidative enzymes, providing this ancient bacterial lineage with the metabolic versatility of a Swiss-army knife. SAR202 was originally identified in 1993 through surveys of marine bacterial DNA conducted by Giovannoni and his colleagues in Bermuda. Thanks to their unique DNA sequences, bacteria like SAR202 that had never grown in the lab were suddenly included in the census of marine microbes, and the oceanographic community was shocked to discover the magnitude and diversity of marine bacteria that had been hiding in plain sight. 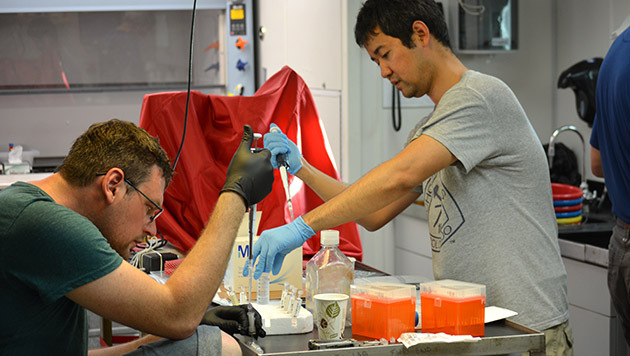 Zach Landry (left) and Jimmy Saw, BIOS-SCOPE scientists from Steve Giovannoni's lab at Oregon State University, prepared microbial samples for genomic analyses during the 2016 cruise. Photo by Jorge Sanchez. From these early surveys, the bacteria named SAR11 famously turned out to be the most abundant cell in the ocean, inhabiting surface waters around the world. But SAR202 is also highly abundant and is, in many ways, an extreme counterpart to SAR11. While SAR11 makes up 30 percent of the cells occupying the sunlit surface, SAR202 can make up 30 percent of the cells occupying waters a half mile to three miles (1,000 to 5,000 meters) deep. SAR11 subsists on some of the most palatable forms of dissolved organic matter, whereas SAR202 subsists on energetically deficient dissolved organic matter “leftovers” that trickle down from the surface. When SAR11’s genome was sequenced, it turned out to be the smallest genome of any free-living organism, and a model of efficiency. In contrast, the new SAR202 genomes are larger and more “gnarly," encoding an array of specializations for survival in the deep sea.